Grow your heart for world mission at Mission Up Close (formerly Friday Fellowship), a CMS event running on the fourth Friday of the month. Mission Up Close is a free event for all, with morning tea included. Bring your own lunch if you’d like to continue the conversation afterwards. 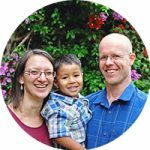 • Adrian and Anita Lovell, who have been serving the Lord in Bolivia and Latin America. • A new secure worker preparing to serve in South East Asia.